Micromax, one of India’s largest smartphone makers, today announced its very first Windows Phone 8.1 devices. Called Canvas Win W121 and Canvas Win W092, the two handsets will be affordable, and should be available across India starting July. 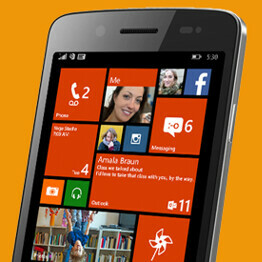 The Micromax Canvas Win W121 is the largest among the two smartphones. It sports a 5-inch 720p IPS display, featuring an 8MP rear camera with LED flash, 2MP front-facing camera, quad-core 1.2GHz Qualcomm Snapdragon 200 processor, 1GB of RAM, 8GB of expandable internal memory, and a 2,000 mAh battery. The Win W121 has a faux-leather rear, and will cost 9,500 INR ($158). Priced at 6,500 INR ($108), the Micromax Canvas Win W092 comes with the same Snapdragon 200 processor, plus 1GB of RAM, 8GB of storage space, and microSD card support. However, its screen is only a 4-inch WVGA one, while the cameras aren’t on par with what the Win W121 is offering: 5MP on the back, and VGA on the front. For now, only the Canvas Win W121 can be seen in official renders. Interestingly, the handset is mistakenly shown over at Micromax’s website as having Android-like software keys. With the Canvas Win W121 and Canvas Win W092, Micromax became India’s first smartphone maker to officially introduce Windows Phone products. Xolo should follow soon. Why does the third photo have android buttons? "Catch" the answer in the article. Why didn't you read the article? My bad, I must certainly have glazed over that part. What's the difference between the Snapdragon 200 and 400 if both are quad-core 1.2GHz? S200 has Adreno 302 GPU instead of 305 in the S400! No, there are S200 with A5 and A7 , this uses A7..
All these new WP OEM's are gonna seriously strengthen WP's market share in 2014, and 2015.. I seriously believe that it can be at around 10% by the end of 2015. Now these phones will definitely sell like hot cakes. Along with XOLO & Karbonn's new WP offferings, future Celkon WPs, local American manufacturers selling their WPs in Latin America (sorry I don't remember their names), alleged WP version of the One M8 and the ever reliable WPs from Nokia/MS, and more OEMs on board, the future definitely looks bright for WP, despite what some haters may say. I see them hitting at least 10% marketshare worldwide by end of 2015 and more than 5% by end of this year.